I always considered Fish Finders cheating or way too expensive an investment for my tackle bag. They were always a piece of kit you would see front and centre on a charter boat or high end fishing boat. Have enough days without fish and you start to wonder what all the fuss is about. ​When it comes to selecting the perfect fish finder there is a huge selection with a million different options available. There isn't a one size fits all best fish finder. Like every good invention there are plenty of competitors in the market and innovation is always producing new models with all the latest features. Lets face it, money doesn't grow on trees ​so if you have a tight budget but still want to get yourself an affordable fish finder then any of the following models will get the job done. The Lowrance Hook-3X Sonar has great graphics (320 x 240 resolution) that are easy to understand and see from wide viewing angles and in full sunlight. 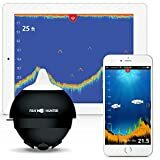 This sonar easily detects the details of a shallow lake or similar fishing spot and gives data on the bottom hardness, thermoclines, structure detail, contour, and fish targets. Plus, the built-in advanced signal processing (ASP) improves on the gathered detail and limits the need to make manual adjustments to see the bottom and structure detail, as well as the fish. The 3-inch LED-backlit color display has a screen that is clear and easy to view (320 x 240 resolution) from most viewing angles while also being easy to see the data in bright sunlight. 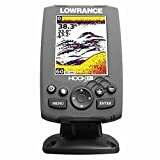 The Lowrance 000-12635-001 Hook-3X Sonar is built to detect all that is going on underneath the surface of the lake or pond, including the structure details, thermoclines, bottom contour and hardness, as well as the fish targets. Plus, the Dual-frequency 200 or 83 kHz is great for maximizing the views under the surface. The Lowrance 000-12635-001 is packed with useful features to help with identifying the fish targets, such as the ability to zoom (4x) in and focus on a particular fishing area, as well as alarm and track options. For improved viewing quality, the device has an option to adjust the display to match the time or day or night to compliment the fishing situation, and the patented skimmer transducer can continue to track the bottom surface when travelling at speeds of up to 75 MPH. Great device at a great price, the Lowrance Hook-3X Sonar is a useful little fish finder that works in shallow and deep water. A great aspect is the clear display that is easy to see in virtually all environments, including bright sunlight, and great at reading temperature and depth. Plus, the sonar comes equipped with everything needed to get set up and working in moments, such as the mounting kit and instructions. The included kit makes it really easy to mount to a kayak or boat. The Sounder helps you find the fish and their preferred habitats by scanning the contours of the surrounding beds and also lets you avoid nasty snags that are lurking in the deep, far beyond your field of vision. You can adjust the frequency of the unit to best find your fish in all water conditions. ​Here is a great video showing you how to setup your fishfinder in a kayak and get straight on to the fish. 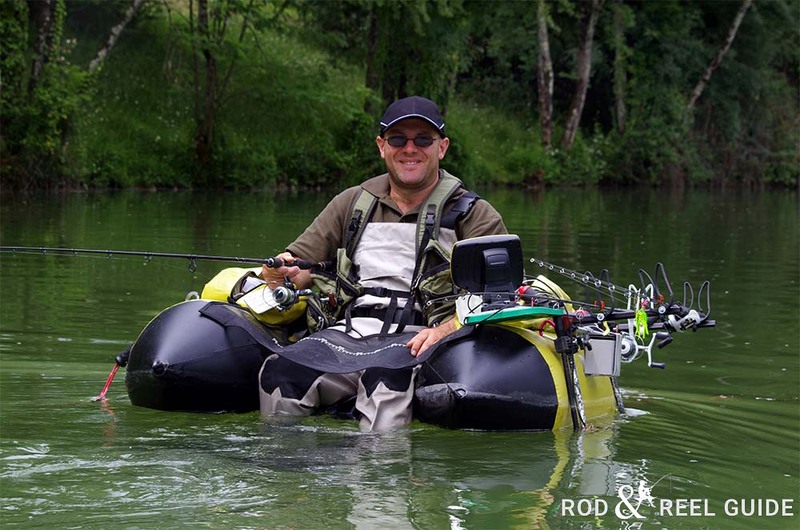 Kayak fishing has become hugely popular over the past number of years and nowadays it is not uncommon to kit your kayak out with a fish finder. Gone are the days when this type of technology was for expensive fishing boats. There was never a simple way to fix your fish finder to your kayak or small portable until companies copped on to the fact that smaller units could be adapted or purpose built to suit. Now you can hook yourself up with a portable unit and fix it to your kayak and off you go. Our favorite model is the ​Garmin Striker 4 GPS Fish Finder. 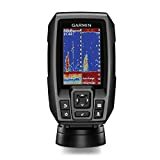 The Garmin 010-01550-00 Striker 4 Fishfinder is designed to be easy to use and packed with a variety of useful features (time, tracking, speed, etc.). A really practical feature of the Striker 4 is the ability to easily mark and return to a favorite fishing spot; this is certain to save plenty of time on future fishing trips to the same river or lake. This Garmin Fishfinder is built with the latest ClearVu technology to make it possible to get a clear view of what is happening in the surrounding water. The high-frequency sonar is built to give virtually photographic quality images that detail the local fish, structures and other objects. The Striker 4 is built with a simple to use keyed interface with multiple buttons to complete the desired command. This makes the fishfinder easy to use and relatively easy to install with its 3.5-inch display size. The CHIRP sonar is designed to send a constant sweep of frequencies to give the most reliable information. This sonar technology is useful for creating the crisp fish arches while also achieving better target separation. The built-in waypoint map simplifies the process of viewing, marking or navigating to a specific location like a dock, stumps, or brush piles. The view display makes it possible to see the information in a classic flasher format which is preferable for vertical jigging or ice fishing. Mount appears decent quality, but is 100% plastic. Great design and function, the Garmin 010-01550-00 Striker 4 is one of the best budget fish finders on the market. It is very accurate in both shallow and deep waters and the GPS technology comes in really handy when it comes to marking a hot spot of fish or even the dock area used to enter the water to avoid getting lost on the way back. Whether you plan to use the Striker 4 on a kayak or pontoon boat, this GPS/fish finder is very hi-tech and intuitive with a nice display that is easily seen even in bright sunlight. This unit really is exceptional for the money and can be installed straight into your kayak. It doesn't come with map info or chats but you can store plenty of points along the way or mark off your hot spots and return at a later date to catch even more fish. The CHIRP SONAR is great for mapping out the structures around you. This continuos stream of info​ plots out everything in super detail. Great for spotting snags and other structures that will definitely be holding fish. The Deeper Smart Sonar PRO+ is a small, high-capacity echo-sounder perfect for adventurous kayak fishing. This is a very cool device that lets you bring your fish finder everywhere with you. It runs it's own wireless access point so you can connect it straight to your smartphone or Tablet. Download the App, get the two talking to each other and away you go. It really is that simple. The App itself operates in online and offline modes and provides a multitude of great features like: Solunar Forecast Calendar, Fishing Notes, Offline Maps, Weather Forecast, Camera, Day/Night Screen and Color Mode. You can even share your info on Social Media if you really wanted to give away your hot spots to friends or clubs in the area. You can get the Flexible Arm Mount to fix this straight to the side of your kayak and keep all of the equipment outside your boat and leave you more room for fishing - not that it takes up much room anyway as it's a complete unit in itself. The Deeper Smart Sonar PRO+ is built with a highly accurate internal GPS receiver and uses a Wi-Fi connection to create the bathymetric maps to make fish-finding that much easier and more productive. This cast able echo-sounder is designed to work with Android or iOS tablets or smart phones, while the Wi-Fi connection helps to extend the search distance with this Deeper sonar equipped to detect depth ranges up to 80 meters/260 feet. The offline mapping and built in GPS receiver makes it really easy to pinpoint the potential catch. The high accuracy GPS receiver has the ability to map the fishing spots, contours and features by using bathymetric maps. This process even works when planning to fish on shore. By creating the bathymetric map it is possible to examine the underwater conditions and determine the best fishing spots. Even though the bathymetric maps are created in real time, there is also the option to store and archive this data for future. Also, this means it is relatively easy to create a personal collection of accurate maps to improve the ability to find the most productive fishing locations. Plus, the Smart Sonar PRO+ is adjustable with the option to adjust the sonar sensitivity to take into account image distractions. By refining the setting it is more readily possible to get a view of the smallest underwater action. The screen color mode is a useful feature to make it easier to see the display screen and match the brightness to the time of day. It is practical for reducing noise and increasing target separation. 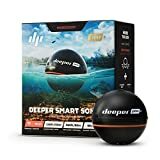 The diminutive Deeper Smart Sonar PRO+ is practical for use with standard rods and lines and measures 65 millimeter / 2.5 inches in diameter and weighs approx 100 grams / 3.5 ounces. Easy castable sonar, the Deeper Smart Sonar PRO+ is an awesome product for the money. 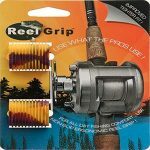 If you want to easily see the structure and depth of the water or simply want to catch more fish, you should really buy this. It is fun and it works, while also being highly useful for all fishermen no matter the favorite fishing spot. It is certainly useful for fishing on shore and gives access to the performance of an echo sounder that was previously available only to boat owners. The FishHunter PRO is a precise sonar that is cast able and easily analyzes the bottom structure of a river or lake and finds fish at a depth of up to 150-ft. It is a versatile piece of kit and is easily placed in an ice hole, trolled behind a boat, or can be cast when on shore. Plus, it easily pairs with a smart phone or tablet to clearly see the underwater structures and features. The FishHunter PRO is built with the latest Wi-Fi Casting to make it fast and responsive and gives a range of up to 160 feet or 50 meters. Wi-Fi wireless connection is so much more efficient than comparable technologies, and nearly 4 times faster than Bluetooth. This sonar is built to work at a depth of up to 150 feet or 45 meters while using the FishHunter PRO, while for jig tracking this can decrease slightly to 100 feet or 30 meters. Use the FishHunter PRO in several different ways, such as casting from shore or on board a boat or even trolled up to a speed of 2.5 MPH. The Transducer tri-frequency makes it possible to create the super-high resolution image to make it easier to analyze the bottom structure and find the fish. The FishHunter PRO is powered by a rechargeable lithium polymer battery that has the potential to last for a period of up to 10 hours. Works great, the FishHunter PRO is a pretty cool item that works as a reliable fish locator and depth finder. The app is quite versatile and goes far beyond the ability to see the structure, features and fish under the water – it is also possible to share or add pictures to let others see the fish caught. It can take a little time to learn how to adjust the sensitivity and turn on certain functions, but with some patience, it is possible to set up the FishHunter PRO portable fish finder to match the specific needs. For the anglers that enjoying ice fishing or fishing in small ponds, then this is certain to make a great invention. Picks up fish without hesitation and the battery life is more than excellent. 【2 Inch HD Display + 140°Ultra wide angle lens】This HD sport camera can be easily previewed videos and pictures, allowing fast forward/rewind videos and offer a wider field of view. 【30m(98feet) Waterproof + 1050 mAh Battery】 This waterproof action camera is built-in with IP68 Waterproof Case, allowing shooting up to 30 meters under water, perfect for water sports lover. Battery Life up to 90 minutes shooting time. 【Tons of Accessories】This Mini Sport Camera comes with tons of accessories which can support to attach to helmets, bike, surfboards, cars and other objects easily. Mountable design for shooting the thrill of extreme activities. 【Widely Use】 Motion detection, loop recording available, this action camera can be used as a security cam, dash cam. IOS, Exposure, Sharpness, White Balance can be adjusted etc. 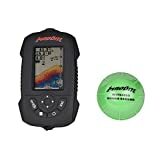 The MadBite FX3000 Fish Finder is a versatile piece of fishing electronics for ice fishing, onshore fishing, kayak fishing or bass fishing. Its built-in wireless technology is designed to locate fish and detect other information from up to 400-feet or 120 meters away. The casting sonar sensor is easily sent into the water from a boat or shore and quickly checks water temperature, surveys the bottom structure and finds fishing holes. Plus, for ease of use, the display screen is in full color, giving the option to read in bright sunlight or low-light conditions. The MadBite FX3000 is built with an LCD screen with 512-color and 2.8-inch width for complete ease in viewing the on-screen data in light or dark environments. The clear screen makes is possible to quickly detect the water temperature, depth, structure and bottom contour. The detection range is in the region of 2 to 150-feet. Also, the unit is designed to easily adjust using the 1-ft micro-tuned setting to concentrate on fish in a specific area. With the ability to send a sonar signal 15 times per second it is possible to get real time information on what is taking place beneath the waves. This portable sonar sensor is useful in both freshwater and saltwater and includes a built-in alarm that gives an alert on finding fish. Additional alerts at given for depth and low battery. The MadBite FX3000 is portable, floats and water resistant so there is no need to be concerned about dropping it overboard. Plus, it does not rely on Bluetooth / Wi-Fi, a tablet, or smartphone to operate. It runs on a rechargeable Lithium battery that has the potential to keep the unit running for up to 20 hours. 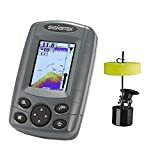 A very cool little fish finder, the MadBite FX3000 with wireless sonar sensor is built with options and feature of the expensive brands, but comes at the very reasonable price. It has a very clear display and easy to use and certain to not let you down when fishing from shore, a kayak, or a boat. The rechargeable battery is great and lasts for a lot longer than needed for one trip. Plus, the floating and waterproof design is a practical and safe feature for using in rough waters.